Nuclear Medicine involves the use of small amounts of radioactive materials, (or tracers) to help diagnose and treat a variety of diseases. Nuclear Medicine determines the cause of the medical problem based on the function of the organ, tissue or bone. This is how nuclear medicine differs from x-ray, ultrasound or other diagnostic tests that determine the presence of disease based on structural appearance. As an integral part of patient care, nuclear medicine is used in diagnosis, management, treatment and prevention of serious diseases. Nuclear Medicine imaging procedures often identify abnormalities very early in the progression of a disease--long before some medical problems are apparent with other diagnostic tests. This early detection allows a disease to be treated early in its course when there may be a more successful prognosis. Today, Nuclear Medicine offers procedures that are helpful to a broad span of medical specialties, from pediatrics to cardiology to psychiatry. There are nearly one hundred different Nuclear Medicine imaging procedures available. Every major organ system can be scanned using Nuclear Medicine technologies. Nuclear Medicine uses very small amounts of radioactive materials or radiopharmaceuticals to diagnose and treat disease. These tracers are introduced into the body by injection, swallowing or inhalation. Radiopharmaceuticals are substances that are attracted to specific organs, bones or tissues and are used to study different parts of the body. The radiopharmaceuticals used in Nuclear Medicine emit gamma rays that can be detected externally by specific types of cameras called gamma cameras. The short answer is, yes! Nuclear Medicine procedures are among the safest diagnostic imaging exams available. A patient only receives an extremely small amount of a radiopharmaceutical, just enough to provide a sufficient diagnostic information. In fact, the amount of radiation from a Nuclear Medicine procedure is comparable to, or often times less than, that of a diagnostic x-ray. Does the Tracer Cause Any Side Effects? Adverse reactions, or side effects, are extremely rare. Let the technologist know if you experience any symptoms during or after the tracer injection. The following is a list of the most common procedures that we perform. Bone scans to examine orthopedic injuries, fractures, tumors or unexplained bone pain. Bone scans may also be ordered for follow-up cancer patients. 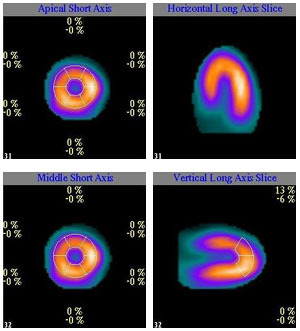 Heart scans to identify normal or abnormal blood flow to the heart muscle, measure heart function or determine the existence or extent of damage to the heart muscle after a heart attack. Breast scans which are used in conjunction with mammograms to more accurately detect and locate cancerous tissue in the breasts. Liver and gallbladder scans to evaluate liver and gallbladder function. Renal imaging to examine kidney function. Thyroid uptake and scans to analyze the overall function of the thyroid and show the structure of the gland. Lung scans to evaluate the flow of blood and movement of air into and out of the lung as well as determine the presence of blood clots. Please ask when scheduling your examination if there is any special preparation. Certain tests may require some slight preparation, varying from fasting six hours prior, to the exam to being well hydrated or no preparation at all. You should tell your doctor if you are pregnant or think that you may be pregnant. You should also tell your doctor if you are breastfeeding. Who Performs Nuclear Medicine Tests? A Nuclear Medicine technologist is a health care professional trained and experienced in the theory and practice of Nuclear Medicine procedures will perform all Nuclear Medicine testing. During the procedure, the Nuclear Medicine technologist will administer the tracer, position the patient under the camera and operate the equipment used in the test. Our technologists are certified and are well-educated in the field of Nuclear Medicine. All of our technologists have attended respectable colleges to attain their certification. Each employee has been through rigorous exams and has spend hundreds of hours in training. You can rest assure that when you are with the Nuclear Medicine technologists, you are in good hands. Why Do Nuclear Medicine Tests Take So Much Time? The amount of time needed for a procedure depends on the type of test. Nuclear Medicine tests are preformed in three parts: tracer administration, taking the pictures, and analyzing the images. For many tests, a certain amount of time is needed for the tracer to accumulate in the part of the body being studied before the pictures can be taken. During the imaging session, the time needed to obtain the pictures (from minutes to hours) will vary depending on the test being performed. You may resume your daily activities after your Nuclear Medicine examination. The radiopharmaceutical you are given will remain in your body for a short period of time and is cleared from the body by natural bodily functions. Drinking fluids will help eliminate the tracer quicker. Most radiopharmaceuticals will be completely cleared from your system after 48 hours. A Board Certified Radiologist will interpret the images from your exam and generate a report with his or her findings. These reports are faxed to your doctor usually within 48 hours of your examination.